This Outlook quick tip is in response to a question asked by an Outlook user who recently upgraded to Outlook 2010. It applies to all versions of Outlook released since. 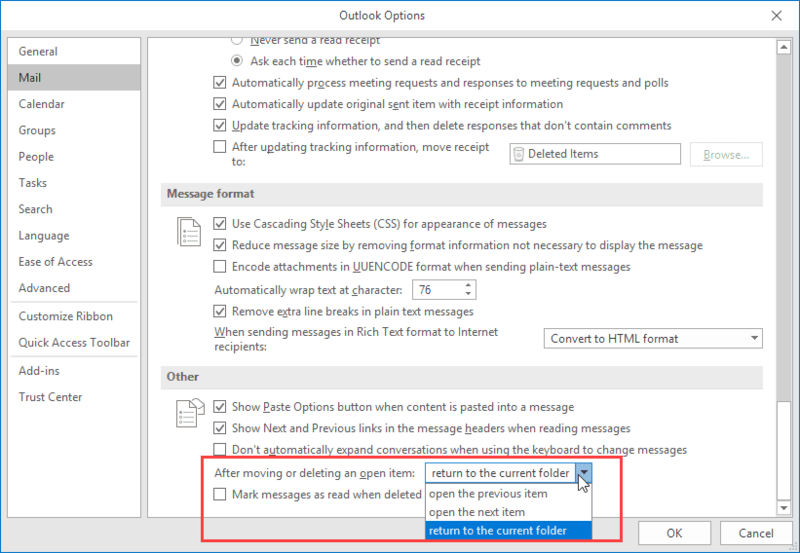 "In Outlook 2003 it was possible to set an option so that when I deleted a message, it would automatically take me to the next message. I can't find that option in Outlook 2010. When I delete, it takes me back to the list of messages." In Outlook 2010 and newer, open the File, Options dialog. The last item on the Mail page is the option for controlling what happens after moving or deleting an item. I should say to move the actual highlighted cursor from one email to the next in the inbox? Is there a way to move to the next message using vba? ie move down in the explorer or up rather than using the arrow keys? Thank you! It was driving me nuts, LOL! It works once then reverts to going to the most recent message after move or delete. Settings are still in place but it appears to have its own agenda. Thanks so much. It was driving me crazy. I really appreciate the quick easy instruction. WOW this was concise and just great!